We liked the location, as good walkers. Blocks are big, which was fine with us. We were close to upper town and the Royal Palace. Our room had a small deck which was pleasant and a frig for keeping beer/ food cold. We liked having food/drink we could buy in the lobby & take to our room. Bathroom fully equipted. Breakfast was more than we expected, at 10$ US per person. Excellent coffee machine & scrambled eggs plus good breads. Excellent and knowledgeable front desk service! My room was very quiet. Wifi worked all the time and was very fast. Bed was comfortable. I really like this hotel because of the kitchenette and small refrigerator. It's nice to shop at the local grocery stores and cook or heat up simple meals in the room to avoid the hassle of going out to restaurants all the time. Helpful staff, we forgot something in the room but we were helped quickly. I especially liked the staff! I would say they were the highlight of the stay. An easy 10-15 minute walk from the Brussels Central train station, the hotel is well situated for exploring the city, and this part of Belgium. The front desk staff were welcoming, informative, and very helpful. This was my second stay at an Aparthotel (I'd stayed at another facility in Caen). These hotels are ideal for extended stays. The well appointed kitchenettes and proximity to a grocery store gives you great flexibility if you're tired of restaurant dining every night. The room was very comfortable. Nice apartment, clean rooms, comfortable, quiet. Very nice and helpfull staff. Very tiny studio but quite well organized. Everything needed in studio is included. Friendly staff, well organized small lobby with some kind of micro grocery store. The apartment has a small terrace with table and chairs where you can have a drink or coffee after work. Apartment is spacious. Location is good (even better for business travellers perhaps). The staff was nice and friendly. There is even a little pantry you could buy ready to cook meals from. The pantry also has an equipped pizza oven in case you are interested. 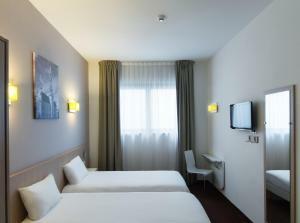 Lock in a great price for Aparthotel Adagio Access Bruxelles Europe Aparthotel – rated 8.6 by recent guests! 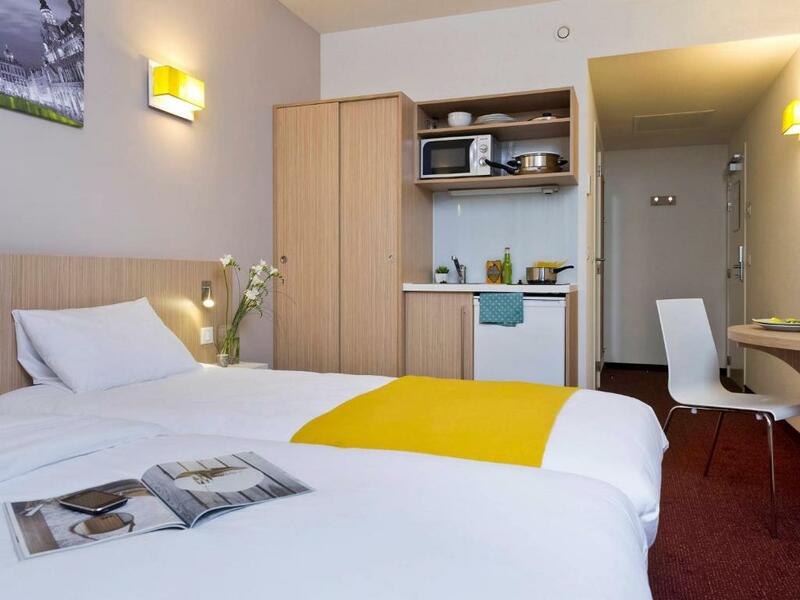 Adagio Access offers studios in the center of Brussels, only 1,150 feet from the Committee of Regions and 900 feet from Troon Metro Station. 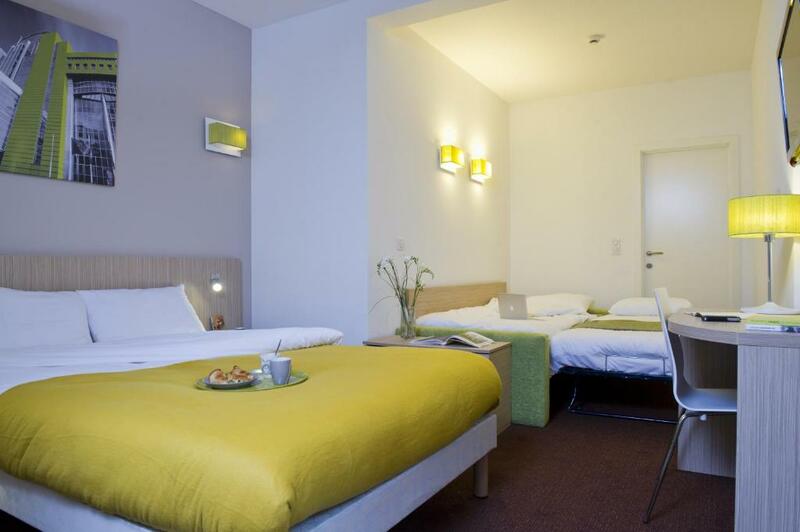 Each studio features flat-screen TV, free Wi-Fi and modern décor. 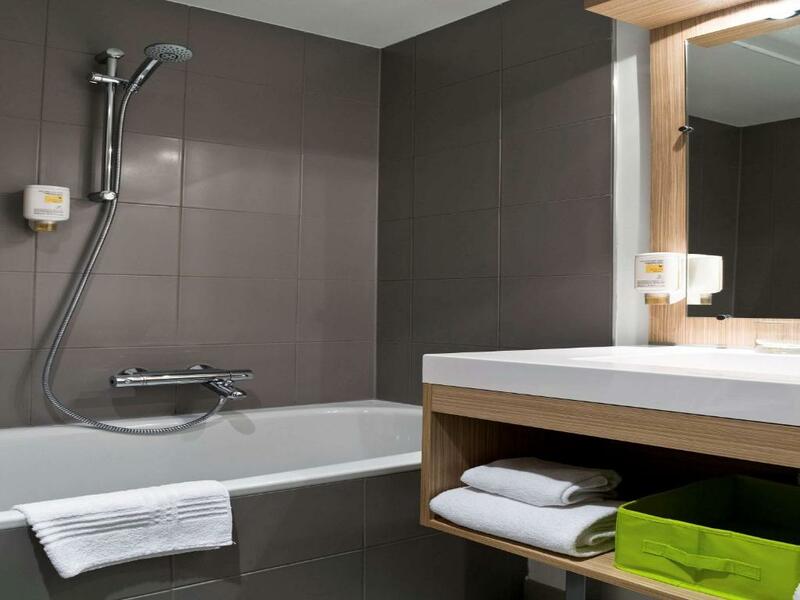 The studios at Adagio Access Bruxelles Europe also come with a sitting area, a bathroom with a bathtub or shower and a telephone. A microwave and refrigerator are also provided and all studios have a stove. Parc de Bruxelles and the Royal Palace are 1,450 feet from Adagio. The Magritte Museum is just over a 10 minute walk away. The studios are only a 10 minute walk from the European Parliament. When would you like to stay at Aparthotel Adagio Access Bruxelles Europe Aparthotel? This stylish studio has a kitchenette, a work desk and a flat-screen TV. 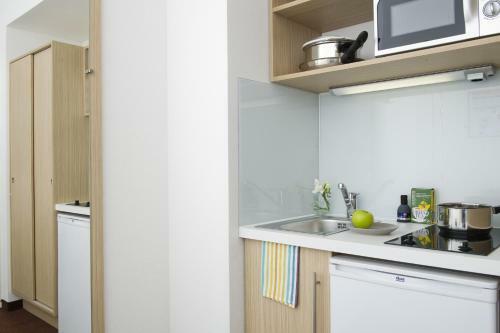 A kitchenette, a sitting area and a flat-screen TV come standard in this large studio. Please note that this studio is not suitable for disabled people. Located closed to the European institutions and the Brussels Parc Royal. Trône metro station is 2 mn away. 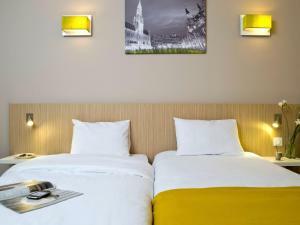 House Rules Aparthotel Adagio Access Bruxelles Europe Aparthotel takes special requests – add in the next step! Aparthotel Adagio Access Bruxelles Europe Aparthotel accepts these cards and reserves the right to temporarily hold an amount prior to arrival. Please note that upon check-in guests will be requested to show a photo ID and a credit card. The details of theses cards must match the reservation's holder's ones. We stayed several days with my wife. Friendly staff and nice position of Adagio, near center and main city attractions, but our room was quiet enough, no noise or disturbance. Reception is open 24 hours, stuff helped with any tourist or living questions, e.g., town map is available, modern elevator. Room (studio) is modern enough with small kitchen. There is also breakfast possiblity for some price, but we have not used it. A small grocery store is quite close. The pavements mixed with suit case wheels - beyond your control I think! Desk is not comfortable to work with computer. No dish dryer in kitchen compartment. Breakfast were to expensive in comparison to the offer. Location close to EU official buildings, easy to access by walking. Personal speaks fluently in English, which is uncommon in Brussels. Rooms are silent. The location is a little bit far away from center. Everything; the women at the reception, the room and its content, the location. It's like a home away from home. The room has everything. Maybe guests should have an option to have an iron. The staff is professional and helpful. It is a noisy hotel from traffic, as it's on a busy street. Street quiets down in the evening/night time, but during day the location is a bit gritty. Didn't really bother us. 10-15 min walk to city centre but nice walk as you walk through the park! Big room for a cheap price. Great stay!